Hi SciCheer fans, Samantha here! 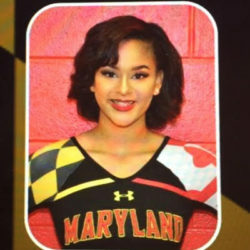 I’d like you to meet Treanna, a student at the University of Maryland majoring in both Criminal Justice and Computer Science. It doesn’t take a detective to see this cheerleader is a STEM rockstar! What turned you on to STEM and when? When I was in 8th grade I was given the opportunity to take the Science and Technology test in my middle school, which would determine what high school I would be going to. The results showed that I scored the third-highest score in my grade. The S&T program at CH Flowers High School was an excellently rigorous program that focused on the areas of biology, computer science, and engineering. I originally chose to be a mechanical engineer because I really wanted to create my own stuff and the idea of working with machinery was interesting to my 14-year-old mind. But after going to engineering camps, I realized that it wasn’t what I wanted to do. 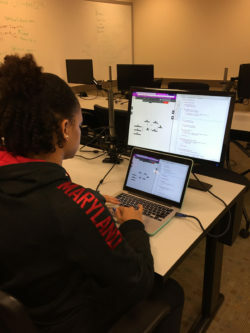 By my senior year of high school, I decided to major in computer science because technology really consumed my life at this point and I really wanted to learn more about coding and making programs. What is your major like? My classes have me write code to create programs, draw pictures, and make games (whatever my teacher wants me to do). I would tell them that I’m always on my laptop because that’s one of the most important tools you need when majoring in CS. I spend a lot of my time in the library (because it’s super quiet) doing research on concepts that I don’t understand or on things I need to get clarification on. I’ve been involved in the cheer world since I was 4 years old. My mom was a cheerleader at High Point and UMES, so she exposed me to it. After cheering all throughout high school, I couldn’t imagine stopping there. There were more skills I had to acquire and knowing that I was going to UMD in the fall, I couldn’t deny the opportunity to cheer for such a great school with excellent sports teams. What does it mean for you to study STEM? With the two majors I’m trying to acquire, I planned on attempting to work for the FBI as a computer analyst. I would be the one gathering information from different databases and hacking into networks and giving that information to whatever department requested it. For anyone that’s seen Criminal Minds, I imagine myself as Garcia. If I were to get a job like that, I would hope to do my best to ensure all the criminals are put away and stopped. My field of work is very important because a lot of crime is happening over the Internet nowadays so it’s imperative to be prepared for any type of crime. How will the qualities that make you a great cheerleader benefit you in your career? Being passionate about my sport boils over to me being passionate about my field of work, which is extremely important: that’s the quality that makes you take the “extra mile.” In cheerleading that can mean staying after tumbling practice to get some one-on-one time with the instructor or doing drills at home to help with a particular skill. In relation to my career, this can mean staying after clock-out time at work to work on a problem instead of waiting until the next morning. It really means putting forth extra effort where others wouldn’t. Another thing I think makes me a great cheerleader is the fact that I take the initiative to ask my coaches about my performance and areas they see I can improve on. This is great for a job because it shows your boss that you’re always looking to make improvement. It’s really empowering being able to defy stereotypes that society has set up for me as a cheerleader. I relish the moments when people realize I’m super involved in my community, I have two majors, I participate in clubs, and I also happen to be a cheerleader. One time I was talking to an acquaintance and when they realized I was a cheerleader, they asked if my major was dance and I couldn’t help but laugh. In the end they felt sorry for undermining my ability to have complex majors. My best STEM-related experience would have to be the county science fair in 5th grade. My science fair project was on the aerodynamics of different paper airplanes and how the shape of them would affect their flight. With a topic like that, I didn’t expect to win first for my grade level, let alone make it to the county fair. At the county fair it was so cool seeing how smart other kids around the county were and all the different questions they came up with. This is the year I developed my drive to be the best. You are beautiful. Don’t let anyone tell you otherwise. You are smart. Do not think that anyone is smarter than you. You have the capability of being as smart as anybody you want to be. Love yourself first. Self-love is incredibly important.